Use your sense of smell to identify fruits. Find out how the smell changes as fruits ripen. 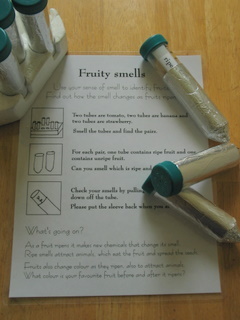 Two tubes contain tomato, two tubes contain banana and two tubes contain strawberry. Smell the tubes and find the pairs. For each pair, one tube contains ripe fruit and one contains unripe fruit. Can you smell which is ripe and which is unripe? Check your smells by pulling the sleeve down off the tube. As a fruit ripens it makes new chemicals that change its smell. Ripe smells attract animals, which eat the fruit and spread the seeds. Fruits also change colour as they ripen, also to attract animals. What colour is your favourite fruit before and after it ripens?